I visited this week old Pizza in the Vile Parle Market right adjacent to Mc Donalds yesterday. They have a small outlet with four tables in doors and four tables outdoors. I could see a clique of college students feasting on some reasonably priced pizzas. 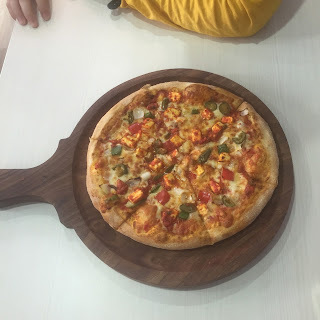 They have regular pan pizzas and medium pizzas along with a Large Pizza Combo apt to order home with some soft drinks while watching a cricket match! We tried their Cheese Garlic Bread that were a tad bit oily and had a very subtle taste. It was average. We tried their Peri Peri Paneer Pizza which was really good. Although it was Indianised, it made for a sumptuous lunch. We wanted to try the different things in the Menu like the Veg Stromboli and Spaghetti Balls but the attendants seemed to be a little reluctant to serve those and discouraged us by saying it would take really long and Garlic Bread is a better option. The service slow, considering it is a Quick Service Restaurant. But all in all you can surely give its pizzas a try!